This week, we look at how frontline staff members at Community Health Center, Inc (CHC) and the Weitzman Institute have worked together to propagate change and improvement in the CHC clinics. 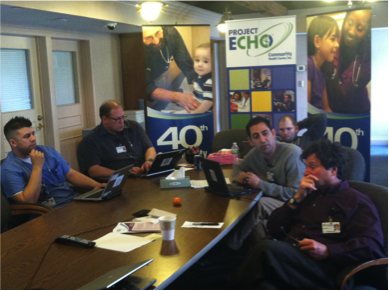 In February 2013, Community Health Center, Inc. (CHC) initiated Project ECHO Buprenorphine, an innovative approach to educating health providers about how to treat patients with an opioid addiction. In August of that year, CHC began work on a 3-year project funded by the federal Substance Abuse and Mental Health Services Administration (SAMHSA), to expand access to buprenorphine treatment to CHC patients by extending Project ECHO Buprenorphine to prescribers of buprenorphine and care teams at CHC. This is the story of Technology Enhanced Access to Comprehensive Healthcare and Buprenorphine Maintenance Therapy (TEACH- BMT). One way of treating opioid addiction without causing extreme withdrawal is to administer buprenorphine (bup), an opioid medication that can be used in place of a stronger opioid like heroin or morphine. Buprenorphine enables the patient to discontinue the use of other opioid medications without experiencing withdrawal symptoms. The goal is to decrease opioid dependence and give the patients a better chance at getting rid of their opioid addiction all together. Although buprenorphine can be prescribed by any primary care provider who is a suboxone-licensed MD or DO, relatively few providers feel comfortable prescribing buprenorphine to their patients without a support system to provide experience and expertise. CHC staff members, Marwan Haddad, MD, MPH, AAHIVS; Richard Feuer, MD, PhD; Cliff Briggie, PsyD., LADC, LCSW; Omar Perez and a professor at the University of Connecticut, Megan Ehret, PharmD, BCACP, serve as the faculty team for Buprenorphine ECHO. Bup ECHO is offered once per month to buprenorphine prescribers and care teams at CHC, and provides them a platform for asking questions about difficult patient cases and receiving feedback from a multidisciplinary team of providers who have experience treating addiction and prescribing buprenorphine for opioid addiction. In order to extend Buprenorphine ECHO to more new bup prescribers and care teams at CHC, Dr. Haddad and Kasey Harding-Wheeler, Director of Integrated Care for Special Populations at CHC, applied to SAMHSA for a grant to cover the creation and maintenance of the TEACH-BMT program at CHC. The program relies on use of telehealth to educate buprenorphine prescribers and the care teams they work with on use and maintenance of buprenorphine treatment for eligible patients. Telemedicine is the use of information technologies or other electronic media to provide healthcare from a distance. It connects buprenorphine specialists with primary care doctors and allows for the transfer of knowledge and information on treatments that can benefit patients without forcing these patients to see a specialist. The Weitzman Institute’s (WI) role in this project is to help launch this initiative and provide the technologies needed. Another one of WI’s roles is to help Dr. Haddad and Kasey Harding assess TEACH-BMT by conducting a study looking at whether provider participation in Project ECHO Buprenorphine and provision of buprenorphine therapy in primary care actually yields better patient outcomes and higher numbers of patients receiving buprenorphine therapy and being retained in care. This project is important to the agency because it helps an often-neglected population of patients have access to treatment for addiction in primary care. The results of the study will serve as a guide for improvements and help to expand this program if applicable. Together, WI and staff members within the agency are beginning to improve a medical process that affects such a major patient population at CHC. I want to give a special thanks to Lauren Bifulco for helping me learn more about TEACH- BMT. Lauren is the Weitzman research associate most involved in TEACH-BMT. She plays a critical role in the project as the Buprenorphine ECHO coordinator and a research assistant. If you are interested in TEACH-BMT, doing research with Weitzman, or initiating a quality improvement study at your CHC site, please contact Lauren ([email protected]) or Ianita Zlateva ([email protected]). Introducing a Sixth AmeriCorps member!